For more than two decades we have been refining advances in islet cell transplantation as a clinical therapy for patients suffering from type 1 diabetes. A great deal of effort has gone to making this a viable therapy for a broader range of patients with type 1 diabetes. Clinical results have progressively improved, demonstrating clinical outcomes on par with other organ transplants, specifically in terms of insulin independence, graft and patient survival. 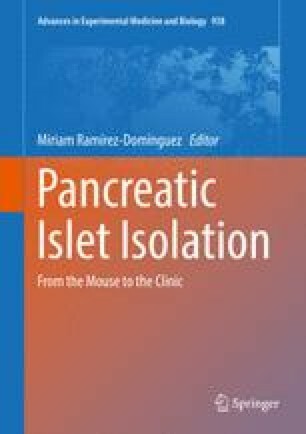 We are now at the point where islet cell transplantation, in the form of allotransplantation, has become accepted as a clinical therapy in adult patients affected by type 1 diabetes, in particular those suffering from severe hypoglycaemic unawareness. This chapter provides an overview on how this has been undertaken over the years to provide outcomes on par with other organ transplantation results. In particular this chapter focuses on the processes and facilities that are required to establish a clinical islet isolation and transplantation program. It also outlines the very important underpinning processes of selection of the organ donor for islet isolation, the processes of organ donor operation and preservation of the pancreas by various means and the ideal ways to best improve outcomes for human islet cell isolation. Providing these more optimal conditions we can underpin the isolation processes to provide islets for transplantation and as such a safe, effective and feasible therapeutic option for an increasing number of patients suffering from type 1 diabetes with severe hypoglycaemic unawareness. U.S. Department of Health and Human Services FDA. International standard ISO 14644 and associated controlled environments [Available from: http://drug.fda.moph.go.th/drug/zone_gmp/files/GMP2549_2/Aug2106/7.ISO14644.pdf. ANZDATA. Australia and New Zealand dialysis and transplant registry 38th report, chapter 2: prevalence of end stage kidney disease. 2016 [Available from: http://www.anzdata.org.au. Al-Adra DP, Gill RS, Imes S, O’Gorman D, Kin T, Axford SJ, Shi X, Senior PA, Shapiro AM. Single-donor islet transplantation and long-term insulin independence in select patients with type 1 diabetes mellitus. Transplantation. 2014;98(9):1007–12.